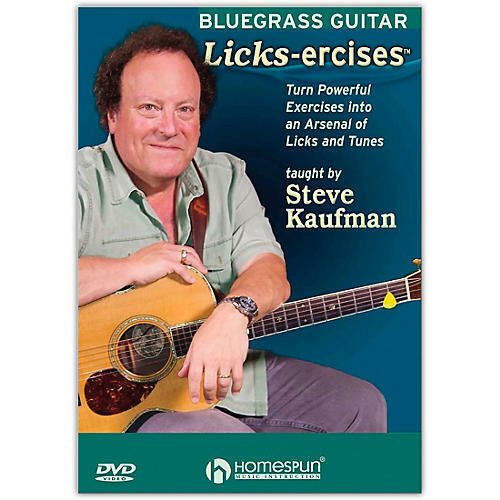 Steve Kaufman's Licks-ercises course will provide bluegrass guitarists with dozens of licks songs and instrumentals while building hand strength coordination precision dexterity and the ability to move seamlessly around the fretboard. Presenting his lesson in four chapters Steve covers a vast amount of material that will keep any player busy for months. He teaches standard bluegrass songs and instrumentals in the styles of Riley Puckett Don Reno Doc Watson and Tony Rice including: Blackberry Rag * Nine Pound Hammer * Stony Point * Three Thin Dimes * Rickett's Hornpipe * Arkansas Traveler * and Blackberry Blossom. He teaches standard bluegrass songs and instrumentals in the styles of Riley Puckett Don Reno Doc Watson and Tony Rice including Nothing to It a bluegrass standard that contains double-stop runs fills improvisation and a not-to-be-missed closing riff that will serve any aspiring bluegrass picker for years of jamming. 2 hours.